Number of tickets sold for tomorrow's Shimizu S-Pulse game: 41639. Number of spectators at Jubilo Iwata's first FOUR home games PUT TOGETHER: 35331. A little later than intended, but here's a summary of Saturday's action. Despite steady falling rain, a crowd 2000 up on the corresponding fixture last year, and over double(!!) what Jubilo got for the same game last week were treated to a surprisingly close and tense affair. We did come out the stronger, and the break though came when Ono's vision and precision passing gave him his first direct assist of the season. Picking the ball up on the edge of the area he spied Hyodo moving into the danger zone. Shinji's inch-perfect ball found the advancing Akihiro and with a control and volley he smashed it past into the net. If we thought it was going to be plain sailing after that we were wrong. Omiya kept searching for a way through, and it came when one of their seven corner kicks was met by the head of Tsubouchi. It left Nishibe no chance and with only 15 minutes left it wasn't looking good for a return to the top of the table. But then substitute Masaki Yamamoto somehow managed to win the game with a freak strike from nearly the corner of the pitch. It was a cross for sure - his own reaction revealed that - but they all count, and we all need a bit (a lot) of luck sometimes. So 2-1, we're still unbeaten, and we stayed top after Urawa lost 1-0 at home to Jubilo of all teams. Saturday the face off with Saitama continues as Urawa are the visitors to Ecopa. 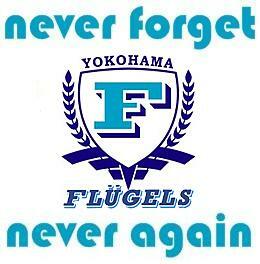 If we win we'll stay top, if we lose we could drop to third depending on Nagoya's result. Ono and Bosnar will both be playing after avoiding any yellow cards on Saturday, and Iwashita is back from injury meaning our back line will be looking a little more like normal. Well, see you Saturday, then! And finally, a big shout out to Steve from Go! Go! 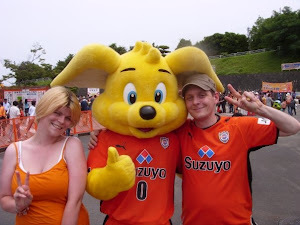 Omiya Ardija - was nice to put a face to name. This is what away days should be about: a weekend away in an awesome (if crazily crowded) city seeing sights, scoffing local delicacies and, of course, watching a cracking game of football. We could have, and maybe should have, won this creating as we did chance after chance. Whereas against Sendai we put most of them away, on Saturday we either failed to hit the target or were kept at bay by some inspired goal keeping. Okazaki was denied on more than one occasion but he finally hit the target in the 70th minute when his shot was deflected home. But yeah, we played well. We're on form and even against a team who will, despite their current position, will surely be at the top reaches of J1 come December. A draw will be harder to take for Gamba who are still languishing uncharacteristically at the lower reaches of the table, and an away point at one of the better teams in the league is no bad result at all. All our away fixtures so far have been against what you'd regard as the better teams in the league and we're still the only team in J1 unbeaten. Only seven games into the season the league table is still pretty meaningless of course, but the next four games against the Saitama teams of Omiya and Urawa, then Kyoto followed by bottom club Niigata give us a huge opportunity to maintain a high position before the World Cup break. With just two starting members remaining from Sunday's defeat of Sendai, it's clear Kenta's mind is more on Gamba Osaka this Saturday than midweek Nabisco Cup group games. Only Arata and Fujimoto were in the first eleven both Sunday and today, and with rare starts given to Hiroi and Sugiyama, it was almost like watching a different team entirely. Well, it would have been if I'd watched it. I didn't. So I'll leave the match report there. What a draw does mean is that we've still in a qualification spot in Group B and a win against Marinos next month will put us in a great position to mount our campaign to progress. Today's second clean sheet in as many starts for rookie keeper Takeda also means we've gone eight games unbeaten at the start of this season. Now someone correct me if I'm wrong, but I'm pretty sure that's a record unequalled in our history. Huge respect to each and every one of you! It's all about taking your chances. The first half wasn't a walk in the park by any means, and neither really was the second. That was until Jungo smashed home Hyodo's rebounded shot to make it three nil. Up till that point the game was pretty evenly balanced, with Sendai creating as many chances as ourselves. But that was the difference today - putting those opportunities in the back of the net. 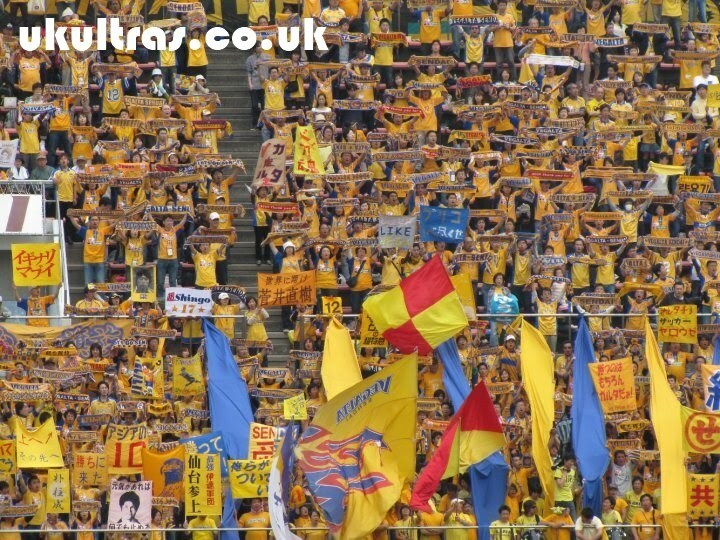 Sendai's excellent travelling support, gracious in defeat, probably felt much the same way. Their one consolation goal at the death was probably earned over the 90 minutes in terms of efforts, but we gave a ruthless finishing display today putting away nearly all our clear cut chances. Johnsen's opener, the big man's first of the season, got things rolling, and Honda's strike just before the break was top draw. On a mazy run into the heart of the Sendai half, he exchanged not one but two lightening one-two plays before despatching the ball past the keeper. The goal which pretty much ended Sendai's resistance came on the hour mark, and we have Fujimoto to thank for his razor sharp reactions. Hyodo's thundering shot came back off the post and Jungo was alert and fast enough to beat the defender to it. Three nil, and Hiraoka made it four three minutes later from a corner, and that was pretty much that. There was still two more goals to come, though, ours from sub Nagai who chased and beat a retreating defender before smashing the ball into the corner in a strike of pure quality. 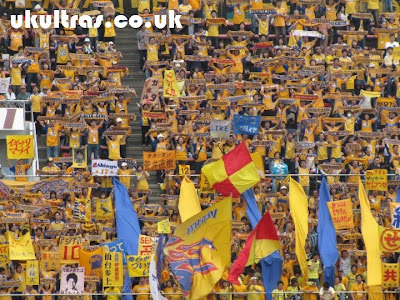 Sadly we let in a sloppy goal at the end, but fair play to Vegalta, at 5-0 down they were still having a go. So not much to complain about today. We're still without Iwashita, Edamura and Aoyama through injuries, so to continue to maintain such a good start to the season is hugely encouraging. I've said it before, but the influence of Ono cannot be understated. He's different class, and the more I see of him the happier I am he came home to Shizuoka. As for Sendai, for a newly promoted team they're not a bad side, but it's fairly safe to say their J1 honeymoon is over. They're a likeable club with a very good support, but some of their players spent more time chewing the ref's ear than anything else. 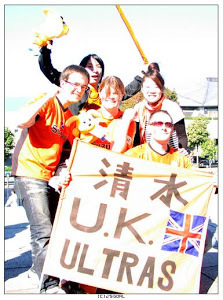 I think they succeeded in annoying pretty much everyone inside Nihondaira (quite possibly including their own fans). Case in point: Fernandinho. He wouldn't make our starting 11 these days, but he won a lot of fans in his spell with us a couple of years back. It was a while ago, but I'm pretty sure he never used to harangue the ref at every decision. He was lucky not to talk his way into the book today as he bitched and moaned constantly, at one point demanding the ref card one of our players. But apart from that, no complaints, just aching legs and a sore throat. Gamba Osaka away on Saturday will be a tough game seeing as they've just had their first win of the season, but avoiding defeat there and a win next week at home to Omiya should see us remain in the upper reaches of the table. Yeah, we're top, but it's early, early days. Full highlights to come as and when, but till then, here's our goals, starting with Johnsen. All come from YouTube user ssnnddttyy's personal cam. Nagai. He didn't manage to catch this one, so it's a partial view of the big screen highlights. Not perfect, but better than nothing! We picked up a crucial away win to maintain our unbeaten start to the season and return, at least until Kashima play tomorrow, to the top of the table. I didn't see the game due to Real Life commitments, but was eagerly checking my mobile phone for goal updates. The first one came almost immediately as Okazaki got back into scoring ways in the fifth minute. He doubled the lead just before the break, with both goals displaying his killer instinct as a predatory striker. His positioning and finishing were impeccable in both instances, and his seat on the plane to South Africa is surely set. Ono was instrumental in both goals. The first came after Ono and Tsujio exchanged a killer one-two move to scythe down the right wing. Tsujio's cross was poorly cleared and Okazaki was clinical in his finishing. We made it two from Ono's looping freekick from the right which was spilt by the Marinos keeper. The ball fell again to Okazaki who made no mistake. Yokohama didn't have a great day at the office, losing returnee Nakamura through injury in the 27th minute and having a penalty saved in the second half. But they were able to pull one back in the last ten minutes when Shimizu's header deflected off an S-Pulse defender to beat Nishibe. We held on for three valuable away points which helps keep up the momentum of our good start to 2010. We managed to pick up three more yellow cards today to add to the five others already in the bag (Ono's on three in total already). We've not won fair play awards in the past by accident, so it would be a shame to see our fair play record slip. Next up is Sendai a week tomorrow. See you there! The goals, and Nishibe's penalty save. 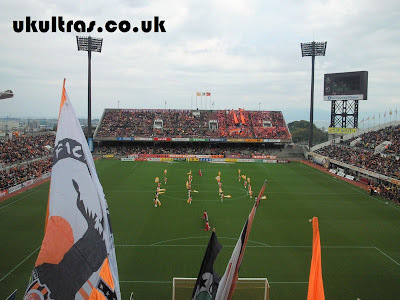 This weekend's bonus video is of Sendai's supporters celebrating their 2-1 defeat of Kashima (and which means we spend the week top of the table).